Explore Denali National before sailing the icy waters of the Inside Passage, see glacier-capped mountains, winding fjords, small islands and wildlife. Cruise through Alaska’s stunning Inside Passage. Be in awe of the spectacular surrounds and scenery. See the abundant wildlife, striking glaciers and pristine alpine terrain of Denali National Park. 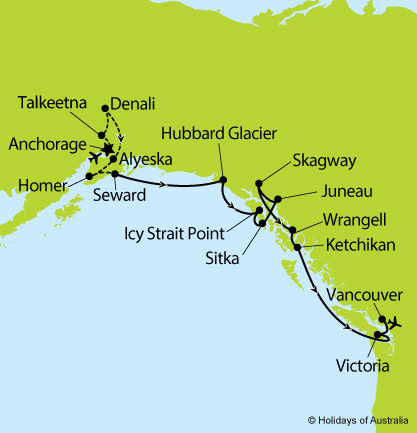 16 night tour and cruise from Anchorage to Vancouver aboard Azamara Quest with touring in Denali National Park, Fairbanks, Alyeska & Holmer and port calls in Hubbard Glacier (scenic cruising only), Icy Strait Point, Sitka, Juneau, Skagway, Wrangell, Ketchikan and Victoria. Includes transfers, on board meals and entertainment. Images courtesy of Azamara, Brian Adams, Destination Canada, Alaska Tourism, Mark Kelley & Matt Hage. *Departures from Hobart are subject to a supplement of $250 per person. Departures from Perth are subject to a supplement of $350 per person.